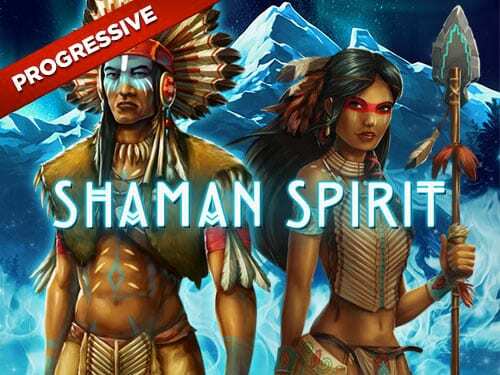 We love this epic new game from Eyecon, with an empowering Native American theme. Trust in the powerful spirits of the natural forces and your ancient ancestors as you embark on this exciting adventure. An inspiring backdrop of craggy mountains falls away into the distance, reminding you that there is no more powerful force than that of Mother Earth herself. Similar respect is shown for the animals with whom you share this landscape, with symbols including a majestic eagle, stoic bear, shaggy wold, and powerful buffalo. Two strong warriors join the animals on the reels. Electric blue accents in the design infuse this dramatic game with an edge of magic and mystery, invoking a chilling sense that you are joined by spirits from the after-life. Brisbane based Eyecon has been at the forefront of the online gaming industry since its inception in 1997. Their most popular slot to date is the immensely successful Fluffy Favourites slot, released in 2006. 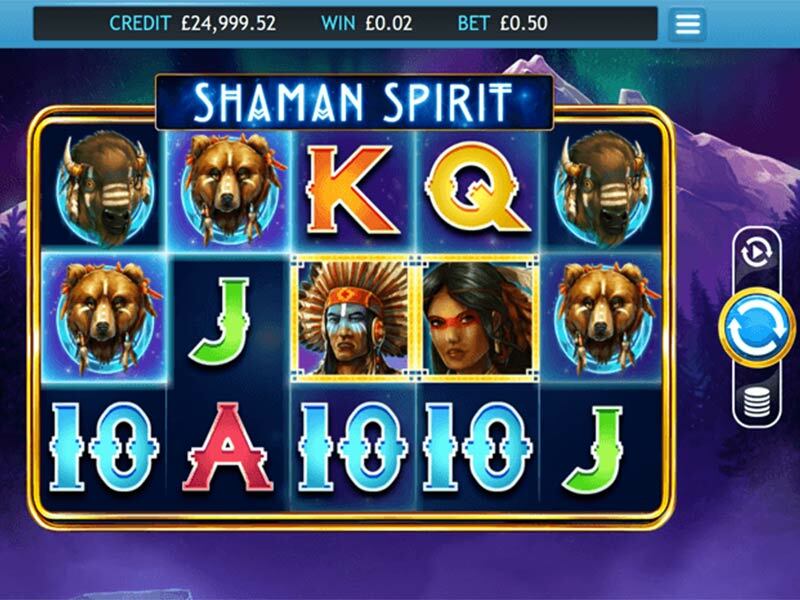 If you enjoy playing Shaman Spirit, make sure you have a go at Eyecon’s earlier game based on the same theme – Shaman’s Dream. Follow the link for online slot games to bring you all the best games from Eyecon. This is a 5 reel slot with 25 paylines and an RTP of 90.01%. You can select a bet of 0.01 to 0.50 credits per line and choose how many of the 25 paylines to activate, meaning a maximum total stake of 12.50 credits. An autoplay feature will take 100 spins for you, allowing you to settle back and enjoy the impressive view over the Great Plains. Get your hands to play the best online video slots today! The Warrior Woman is the Wild symbol in this game – line up 2, 3, 4, or 5 of these powerful ladies to win yourself 10, 200, 2000, or 9500 coins respectively! In addition to being the highest paying symbol in the game, she can substitute for all symbols apart from the Scatter to secure you more winning combinations. If she is part of a winning sequence, your prize will be doubled. The male warrior is the next most important character to keep an eye on – if 3 of him appear on screen at any time you will trigger 15 free spins during which time any wins will be tripled! In addition to activating free spins, this powerful soldier pays out – if 3, 4, or 5 of him appear anywhere on the screen at the same time you will be rewarded with 5x, 20x, or 450x your total stake! If that isn’t enough to get your adrenaline pumping, this game also features 3 progressive jackpots – Mega, Maxi, and Mini. These can be triggered at random at any point during the main game (not during free spins). 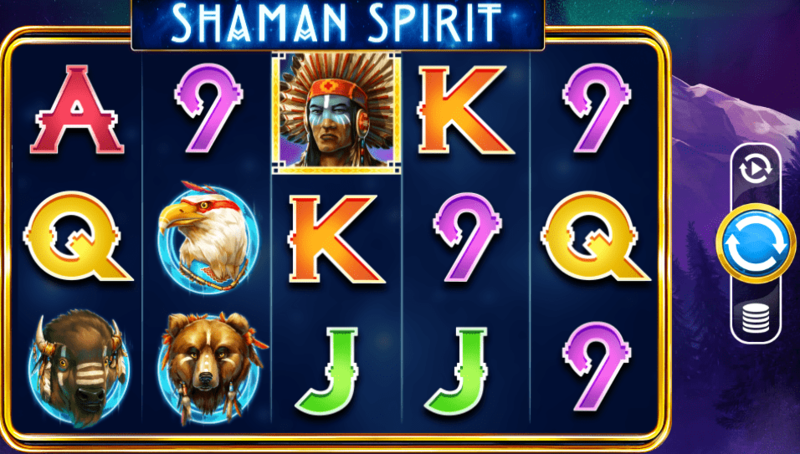 I love the design of this slot, which injects a mystical quality to the naturalistic style of the Shaman’s Dream slot by Eyecon, whilst retaining the same characters and storyline. There is the possibility for some large prizes thanks to the 3 progressive jackpots, and Scatters and Wilds that payout!